End / Start of a year is a great time to lookback on the work and assess / plan . 2009 was our 1st full year at Deepam. Its also the year where a number of people have stepped forward to contribute / give back. Being entirely volunteer driven, this is a significant step at Deepam. Volunteers are also ‘connecting’ with the kids, which is a big step towards making a positive impact on the children. On the organisation front, we are beginning to be recoganised by external organisations – we are able to now partner with others, lot more easily. We are also getting our act together on fundraising , which is much required activity for our infrastructure needs. We added 4 new centres and 140+ students in our programs in 2009 alone. That number, ofcourse, doesn’t matter as much as how much ‘impact’ we made. We are improving this, as we go. As we end the year 2009, I want to thank all the volunteers for the dedication and sincere effort. Without you, Deepam wouldn’t be able to ‘bridge the divide’. In 2010, our focus will be mainly on improving the impact we make, on the students. We will be working on a curriculum relevant for deepam ( tailored for each centre ), that excites and interests the students. Infrastructure availability ( internet and a good student : computer ratio ) will be a priority as well. Finally, volunteer support at each centre, to ensure our children have the mentorship they need. 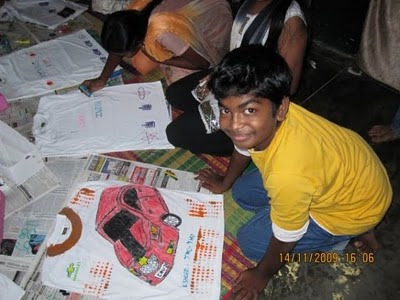 2010 will be an exciting year at Deepam – Lets make more impact on the children. Wish all of you at Deepam, a happy holidays and a fantastic new year. New Deepam Centre – VRS. The New Deepam center @ Venkata Ramana School, Alwarpet got off to a great start with a vibrant inaugural session this morning at 10.30 AM. The Principal was waiting eagerly for us along with Mr.Janardhan from Rotary who connected Deepam with VRS. And when Abhinav walked in with camera in hand, it was time to begin. Twenty select children from 5th grade were made to assemble in a small, tidy classroom. Basu gave a cute intro about Deepam to the wide-eyed kids in his bengali tamil. We shared the short term Objectives to be met by Deepam, and the Principal emphasized to the students the unique opportunity that they were getting. Over the next half hour each volunteer guided students with filling the Know Your Students Form. It was Thilaka Ravi who took over at this point, with a very effective session on spoken English covering basic action verbs. The loud and energetic response of the VRS children charged the classroom, and even we volunteers who were watching got pulled into the exercise of structuring simple action sentences ! Her teaching skills left us feeling that the right person was in charge here ! Meantime new volunteer Pradyut supported by another new volunteer Abhishek, brought the 4 OLPCs that were being charged in another classroom. I must mention here that Pradyut had come over the previous evening after a long day at IIT, and after tinkering around with an OLPC took it home to get a proper feel of it. Such involvement is indeed very reassuring. The class was divided into 4 groups and the session on Paint that followed proved that children’s curiosity about computers is a universal thing. Each child got a chance to draw shapes, and fill colour. Earlier we were wondering if they might need a mouse for easier navigation, but the children surprised us with their quickness in learning to point, click and drag the cursor with the touch pad. Two hours just flew past, and when we were leaving, almost every child came forward to shake our hands with a smiling Thank You or Happy New Year. A great start it was this morning ! Another chance indeed for Deepam to empower deserving children ! 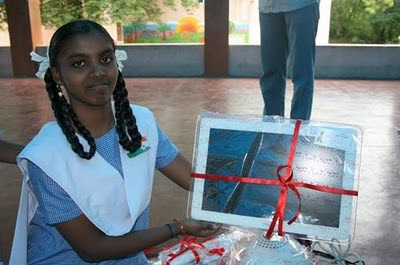 Friends – We have some good news – Our Friends at Cognizant (CTS ) / Team Everest have donated 10 new OLPC’s to Deepam. These laptops will be used at the new centre that Deepam’s starting this weekend at Alwarpet,Chennai. The class 4/5 students at this school will benefit from these machines. Anuradha ( quick thinking, as always), has some wonderful ideas to put the OLPCs to use, at the centre. We will hear more from her, in the coming days . A big thanks to Kartheeban Chandramohan, founder of Team Everest for supporting Deepam. Also, thanks to Srini for liaising with Team Everest and making this happen. The Library project was launched on the Children’s day . Children at 2 centres ( West Mambalam and UK Centre ) will be able to utilise the library, for a start. We will soon roll out the project at other centres as well. Library will be a ‘student-run’ and volunteer-supported project. Deepam is partnering with Nalanda Trust in this project. Nalanda Trust is run by Kavery Nambisan, an Indian Novelist / Doctor who was nominated for the Asian Booker prize last year. Deepam and Nalanda share a similar vision , to provide access to books for the children and encourage them to take to the books and benefit, just like all of us. Nalanda trust currently runs libraries at Pune / Hyderabad . Nalanda will be supporting the library project, financially and Deepam will be running this library. Inaddition, Deepam will benefit from Nalanda’s experience in running the library project in other cities. Thanks to all the Deepamites who helped launch the Deepam-Nalanda Library project – Saye and Sriram in particular took initiative and made the library ‘ idea ‘ , a reality. We were hoping the rains would go away for that special day, but no, it was pouring ! An hour before the event, we inspected the premises and noticed some water trickling in. But thankfully, once the celebration got underway at 2.30pm, nothing seemed to matter. The regular set of children turned up, and after several smiley exchanges of Happy Childrens’ day, the white Deepam T-shirts were distributed to the them (S-M-L). Out came the fabric colours, and then, ever-energetic Archana gave clear instructions to the children on how to use each type of colour, wax crayons, blocks, rollers and tubes. Newspapers were spread all over the ground, and Radhika took charge at the centre of the circle formed by the group. They couldn’t wait to begin. Over the next hour, as we strolled around, we saw different pictures emerging on each T-shirt….brand Nike, Michael Jackson, Chevrolet Cruze and what not ! Many of them highlighted the round collar too. It was a riot of colours ! The masterpieces were then collected and using hangers, were hung out to dry on a makeshift clothesline. Wow ! It was brilliant to see them all together! It was then time to Launch the Library project, a new initiative at Deepam. Ram engaged the children in a discussion about the significance of a library and reading, and soon the set of books were given out to the children, mostly based on the child’s interest. We hope to get the children hooked to the reading habit, and judging from the initial response, it may be easier than we think. The serious bit over, all eyes were now on the chocolate truffle cake placed enticingly on the table. The cake cutting made the event like one big birthday party. The plates with cake and biscuits were passed around to all the children, the caretakers, and volunteers. ….All this while, something was happening behind the scene. The surprise of the day was the deepam Tiger ! The children were amused and happy to see a growling tiger suddenly emerge from the back, and enjoyed taking pictures… Srini’s efforts paid off and the Tiger was a super hit ! All happy faces, more exchanges of Happy Children’s day and it was time to go. I spent my best Independence Day ever and so did KK, Ram, Archana, and Dr.Karthick. I opened my eyes on 15th August morning to a light drizzle and a cool climate whihc cheered me up instatntly. The lovely weather was a precursor to the day that would follow. Deepam launched the “Take Home a PC” initiative at the Olcott Memorial High School. A week back Muthuselvi would not dream of an ordinary desktop and now, she got her hands onto an Apple Mac PC. After the I-Day ceremony concluded at OMHS, Muthuselvi was informed and she was dumb-found and left without any words to express herself. All the teachers at Olcott, headed by the HM Mary Miss and the Director Lakshmi Maam, witnessed and expressed their hopes on Muthuselvi. One very important thing to note is Muthuselvi is quite familiar with Windows but we knew she was alien to Mac.This has provided her with one more challenge which we are very sure she can tackle. She is strong on her fundamentals and quite inquisitive by nature. It will be very interesting for a girl of her talent to venture forth and discover new things. After all life is an exploration itself!!! I am glad to announce the launch of an important an program, “Take home a PC‘ , which we hope will be a precursor to the ambitious “one laptop per child” program. This is an important milestone in our journey and glad we are able to do it this year..
All of know the importance of computers and its power to transform lives. Many of us have directly benefited from our exposure to information technology and for some of us (like me) it is our livelihood. We are not just talking about computer technology, but leveraging computers as enablers to better the lives of less privileged kids amongst us. India as a country cannot progress if significant population of our society does not have access to tools that enable them compete in the global economic playing field. With the equal access to educational tools like computers, kids from less privileged background can perform and shine at par with the other kids. That’s why we are very excited about the small beginning we are making with Take Home a PC. our objective is quite simple with Take Home a PC.. Deepam would like to give a PC and possibly access to Internet to every child who successfully complete one year program. This we believe will open the whole new world of possibilities to the kids and their families. Take Home a PC makes a small beginning this Saturday @ Olcott Memorial High School. We will be giving a PC to an exceptional student who went through our program last year. She is intelligent, bright and more importantly has passion for learning. We are truly delighted to see Muthu being the first recipient of a PC under this program. We would really appreciate if you can be present @ Olcott for this brief ceremony which will happen along with the Independence day flag hoisting ceremony. Details as under.. When: Flag hoisting ceremony starts @ 8:30AM and our program would be around 9:00ish. 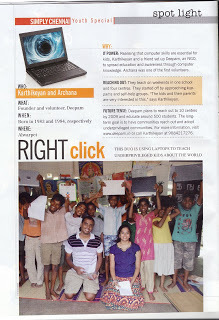 Deepam and our work featured on India Today – the volunteer team represented by Archana and Karthikeyan.